Details: All concerts are free admission, with a suggested donation. For full details, visit http://www.reddoormusic.org. 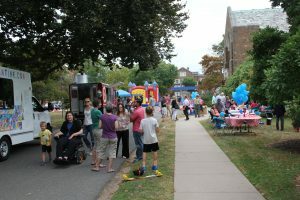 ALL are invited to our 3rd annual Community Block Party at St. John’s Episcopal Church, on Sunday, September 9 from noon to 3 p.m., following an outdoor Sunday Eucharist at 10:30 a.m. Bring a picnic or buy lunch here: hot dogs, pizza, and ice cream. Enjoy live music by local bands (The Hartford Steel Band (11:45), Beatles Covers with Jeff Verney & Steve Metcalf Folk, Rock, & Americana with The Alternate Facts, and Celtic Music with Norb Spencer & Friends), along with a bounce house and other fun activities for kids, tours of St. John’s historic building, and more. Free admission, rain or shine. Everyone is welcome!